Livelihood implements were distributed to low-income families and to those engaged in small- scale industries in Akkaraipattu DS division recently. Nearly 386 families from the Akkaraipattu Secretariat Division benefited by this program at a cost of Rs. 8 million under funds allocated by Industry and Commerce Minister Rishad Bathiudeen. 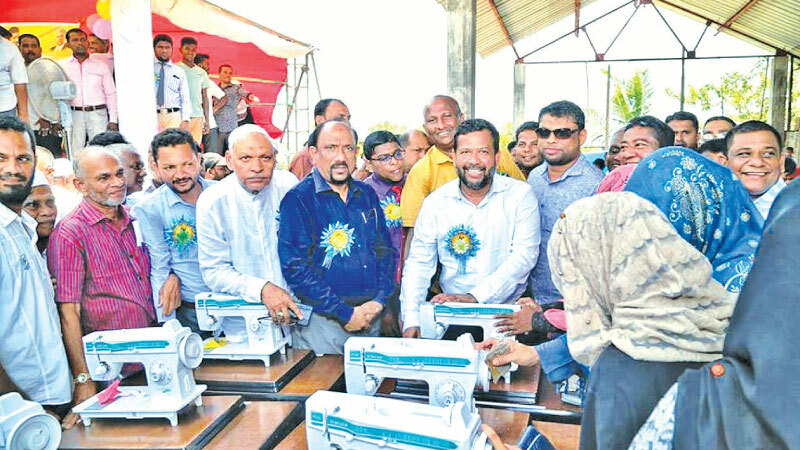 Industry and Commerce, Resettlement of Protracted Displaced Persons, Co-operative Development and Vocational Training and Skills Development Minister and All Ceylon Makkal Congress (ACMC) Political Party Leader Rishad Bathiudeen, participated as the Chief Guest and handed over implements to small industries and its accessories were distributed at the event. Sewing machines, bicycles and other items were among the equipment distributed. State Minister M.S.S. Ameer Ali, Deputy Minister Abdullah Mahroof, Parliamentarians Dr. S.M.M. Ismail and A.R.Ishak, local politicians and many others were present at the event.